NEW WORLD RECORDS: Norway can now boast the world’s biggest ski jump, and it’s NOT Holmenkollen, which is getting the most attention these days. The newly expanded jump at Vikersund, an hour’s drive west of Oslo, opened this week and already has registered its first world records. First jumped Johan Remen Evensen of Molde 243 meters during a test jump off the new Vikersundbakken on Friday. That was the world’s longest jump ever. Then, in a qualifying jump for Saturday’s ski flying championships, he landed at 246.5 meters, and the crowd at Vikersund exploded. Evensen himself was overjoyed, and reportedly had to take a quiet walk in the woods afterwards to calm himself down. His jump beat the last world record set by another Norwegian, Bjørn Einar Romøren, at Planica in March 2005. Andreas Vilberg’s 220.5 meter test jump at Vikersund earlier in the week had showed what was possible off the new Vikersund hill. “I could fly a lot further on this ski jump,” a proud Villberg told news bureau NTB. “I can’t describe how good it is to jump off this hill. It should be possible to clear at least 245 meters.” Something Evensen proved was highly possible indeed. Last summer the International Ski Federation, FIS, changed its rules and allowed for bigger ski jumps. According to FIS, the maximum size will not be increased for many more years, reports Norwegian Broadcasting (NRK). 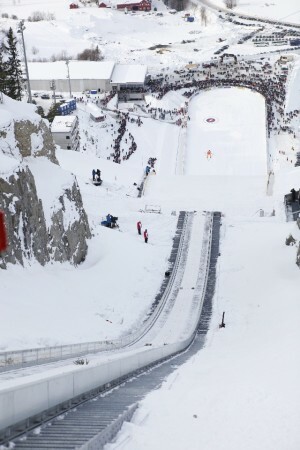 There is competition not only among the ski-jumping athletes themselves, but also among venues. Planica in Slovenia has had the biggest accredited ski jump for 19 years. Now Vikersund hopes to remain the biggest for at least as long. The designer of the Vikersund hill, Janez Gorizek, has already made drawings for a new 300-meter hill in Planica, but it will not be built until FIS approves still larger ski jumps. “I don’t think the rules will change for another 10 years,” Walter Hofer, FIS ski jumping organizer, told NRK. This Wednesday the first jump on the world’s largest hill was carried out by Vegard Swensen, a 24-year-old skier from Asker outside Oslo. “I wasn’t nervous until I sat on the beam, but then I really felt it,” Swensen told NRK, describing the plank competitors sit on before they start their rapid downward slide to the edge of the jump. He was reasonably happy with his 162-meter jump. “It wasn’t a huge jump, but it was quite OK. It was good and safe,” Swenssen told NRK. One test jumper had a camera mounted on his helmet. See a video of what it was like for him to fly off the Vikersund ski jump here (external link).